Soumita Saha is just 20 year old Kolkata girl, but the fame and repute she has attained at this tender age puts her into the league of elevated celebrities. Soumita is a singer with a pleasant voice with an equally beautiful looks. To be specifically called, she is an Internet Celebrity. Her Youtube Channel has over 1000 subscribers, while her Facebook page Like is close to 5000. Her father Swapan Saha is a noted Singer in Kolkata, while her mother Madhumita Saha is a journalist. Her Musical journey started at tender age when her parents bought her a toy Piano. Since then, Soumita never swam out of the sea of music. The only child of her parents, she was given enough freedom to choose Music as a full time career. She won several accolades at school level, performed at various occasions, was trained under eminent musicians and is now a part of several music bands. She captured the vision of print media in 2002 after winning a gold medal in a reputed music competition in Kolkata. At age of 10, the child artist was on lime light. He first big break came when she performed live on ETV Bangla. Since then she has performed on various big platforms. A local Radio Station Radio JU also broadcasted her Interview in their program Sanskriti. This gave her energy to add her performance on Youtube. Soumita uploaded her song on YouTube Which gained her appreciations from several anonymous people as she says “I am not a tech savvy at all. Singing is my passion, in fact I am a low tech person“. She is a versatile singer who did justice to songs like Ek pyaar ka nagma and Kuch is tarha teri palkein. Recently, her Mix album Tu Tu hai Wahi was released by Musicstars. When not singing, she is busy with her paintbrush or penning down poems. Her painting collection can be viewed here. She is also an avid blogger and posts about a variety of issues. 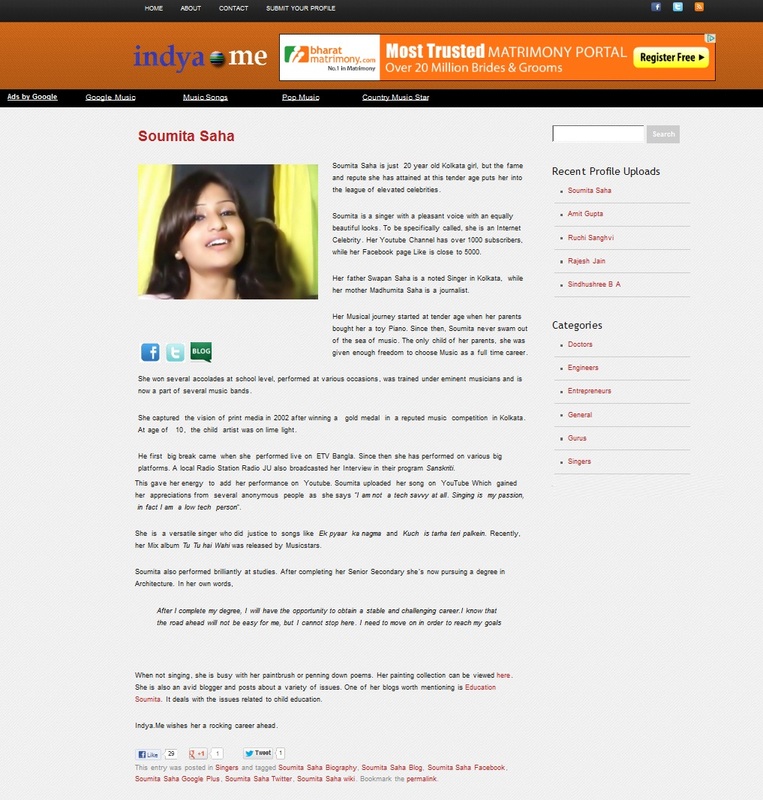 One of her blogs worth mentioning is Education Soumita. It deals with the issues related to child education. Indya.Me wishes her a rocking career ahead. This entry was posted on October 16, 2012 by kolkataemedia and tagged FACEBOOK, Soumita SAHA, YOUTUBE.